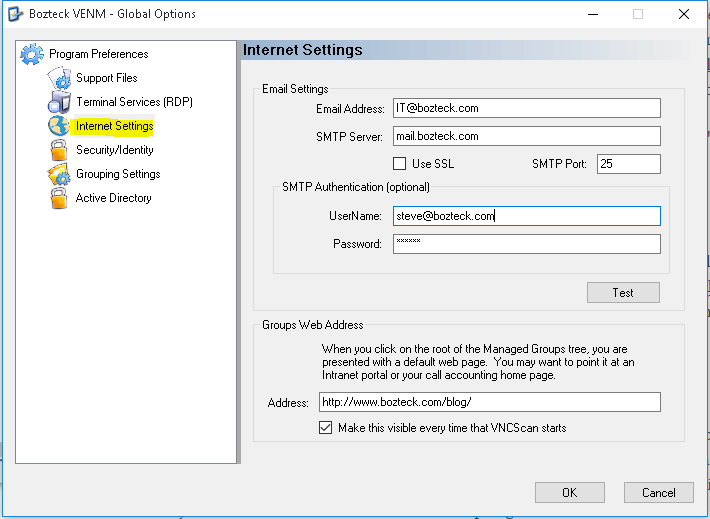 Most IT Professionals already know that Bozteck VENM is a user friendly way to manage all of your devices using RDP, VNC, SSH, and custom scripting. 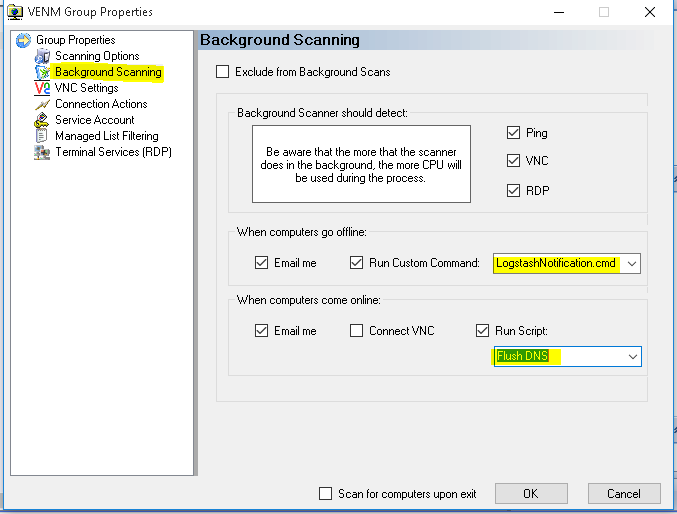 Today, I want to show you a lesser known background device monitoring feature in VENM that allows you to easily keep your device information fresh using the background scanning functionality. I highly encourage you to use the latest version of Bozteck VENM for this feature as it has been greatly improved as of 2016.3.28.230. If you right-click a group or a device and choose “Properties”, you will be able to either exclude that device or entire group from the background scan. In addition, you will be able to set which services are to be monitored and what actions to take when a device fails or comes back online from a previous failed state. If the previous state of the device was “online” for any of the monitored services and now one of those services are not online, you will receive an email notifying you of the change. be sure to set up the email settings later in this post so that VENM knows where to send the messages to. The available options that you have for custom commands is drawn from the global custom commands list that is used elsewhere in VENM. There will be a later blog post covering the in’s and out’s of custom commands but in short, they run locally on the computer where VENM is installed and not remotely on the monitored device. You can create custom commands from the main VENM window under the “Tools” then “Scripting and Commands” menu item. This is sort of a legacy option item from the days when VENM focused mostly on VNC for remote desktop control. In future versions, this will expand to allow for RDP and others. It simply attempts to open a VNC remote control session to the remote computer once it’s up and running again. This is a script that will run remotely on the monitored device once it is responding again. It is useful if you would like some action to be taken on the remote PC the next time that it boots up. Just like the custom commands, this list pulls from the global scripts collection that you create under the “Tools” then “Scripting and Commands”. 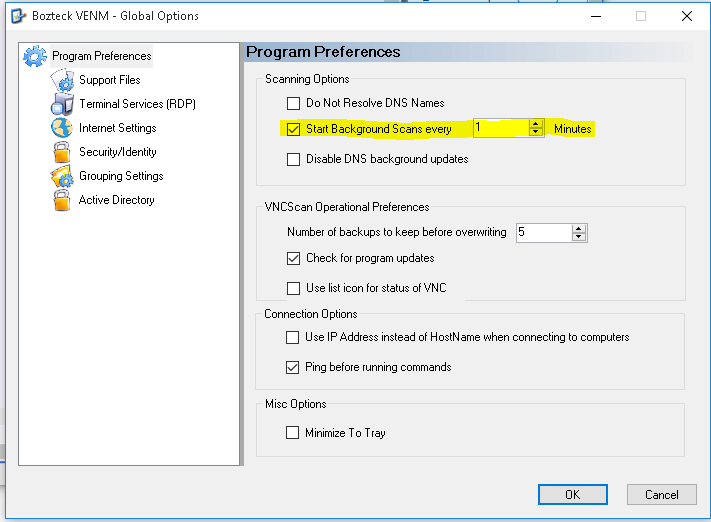 In order for VENM to send you notificaiton emails, you will need to configure the email settings under the “Internet Settings” of the main program preferences. After you have filled in the settings that pertain to your network, be sure to click the Test button to make sure that the settings work properly. A test email will be sent to the email address with a sample report. That’s it! If you have any troublesome devices that cause too many errors, you can simply turn the notifications off for that device in the device properties window. While this doesn’t replace fully featured monitoring tools like PRTG or Microsoft SCSM, it does give you a decent amount of functionality for no added cost to your standard VENM license. This entry was posted in Announcements, howto, Uncategorized and tagged monitoring, notifications., ping, prtg, RDP, Scanning, scsm, venm, vnc. Bookmark the permalink.